Why do you need my app, you ask? Let me start by sharing two very interesting quotes about eclipses. First, "A total solar eclipse is the most UN-NATURAL, NATURAL event you will ever witness (original author unknown). Second, from Michael Watson, a Canadian eclipse chaser, "your IQ goes down during the 30 seconds before the eclipse to about 1/3 of its normal level". Regarding the first quote; a total solar eclipse is amazing to witness! There is so much to enjoy other than just totality. Someone has to teach you what to enjoy, when to look for it and remind you to look for it and my app is the only app out there that does this. I want you to thoroughly enjoy a total eclipse! Using my app is just one part, of three parts of eclipse education that I provide for you. The second is the information on this website and third is my YouTube channel called Solar Eclipse Timer. The second quote; it is amazingly exciting when it gets close to totality! It's intense, eerie and almost overwhelming if you are trying to concentrate and do eclipse photography. I know this from personal experience. You will forget things if you don't have pre-programmed help! My first total eclipse was in Africa in 2001 and I prepared a lot, and practiced a lot! But I was overwhelmed and distracted by the ambient changes just prior to totality. It's hard to concentrate! I learned that you CANNOT time an eclipse with a wristwatch. That experience started my passion for trying to become an expert eclipse chaser. 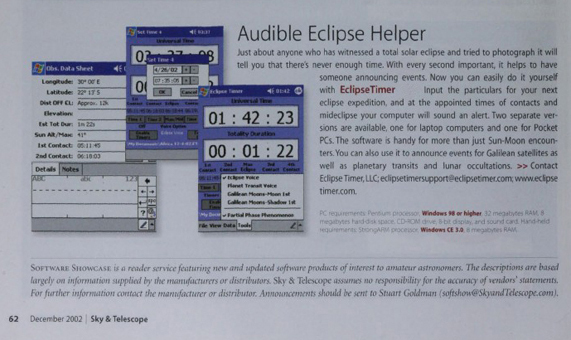 After that eclipse in 2001, I developed the first ever eclipse "talking timer". I designed and developed it to aide eclipse observers and photographers. I used it to help me time my second eclipse in 2002. Back then it was a program that ran on Windows Pocket PC. It was a manual version of what my mobile app is now. The mobile devices we have now are SO much more powerful that many, many things can now be automated. In addition to being the "Original Eclipse Talking Timer", my app has three absolutely unique features that I was the first to bring to eclipse observers. 1. 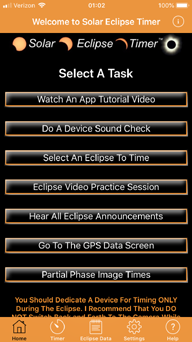 A built in practice session where the timing functions are synchronized to my eclipse observation site video so you can run practice sessions. 2. A practice script that allows you to hear all of the announcements and practice using your device, meaning learning how to properly unlock it and continue to time the eclipse like you will need to do on eclipse day. 3. The Partial Phase Image Sequence Calculator (PPISC) that automatically provides you with perfectly distributed times before and after totality to get a perfect sequence of 20 partial phase images. I am the first person to ever provide these time calculations in an automated way to eclipse photographers. To summarize, my app will calculate your exact contact times once you are at your final observing location. Then it will run a script based on those contact times where I will do an audible countdowns to the contact times, announce important observing events before, during and after totality and give helpful photography reminders. It really is a crucial observation and photography aid! I have an 18 year history of trying to help people observe and photograph total solar eclipses. It is a big part of my interest in amateur astronomy. After seeing my first total solar eclipse I was hooked and I want other people to enjoy this thrilling event.